Hartford, CT– The American Society for the Prevention of Cruelty to Animals® (ASPCA) has announced that 2017 Connecticut’s Kid Governor® (CTKG) and Milford resident Jessica Brocksom will be honored as the ASPCA Tommy P. Monahan Kid of the Year Award Winner. The national award recognizes a child who has made a unique and impactful commitment to animal welfare. Brocksom was chosen as this year’s recipient after promoting her platform “Helping Animals, Those Without a Voice” throughout the state of Connecticut following her election and inauguration as Connecticut’s Kid Governor. “I am so honored to be chosen for the Tommy P. Monahan Kid of the Year Award, and I’m so happy that this amazing organization is helping so many animals out there and giving them all a voice. So I think the ASPCA for everything they do for the animals,” stated Brocksom. CTKG Jessica Brocksom was elected by her peers as Connecticut’s Kid Governor during last year’s Statewide Election thanks to her platform supporting the humane treatment of animals. She has held office since January 2017. During her term, Jessica has been busy promoting collection drives for local shelters, working with state officials to enforce tougher laws against animal cruelty, and educating fellow students about responsible pet ownership. This past spring, Jessica advocated for a piece of legislation allowing children to have therapy animals with them while testifying in court, which was ultimately passed by the Connecticut General Assembly. During the summer, Jessica worked on a Milford, CT city-wide awareness campaign called “Heat Kills,” that reminds people of the dangers of leaving dogs and other animals in cars during hot weather. The ASPCA is the longest standing animal welfare organization in North America and serves as the nation’s leading voice for animals in crisis. The group will honor Brocksom with the Monahan Kid of the Year Award during this year’s Humane Awards Luncheon on Thursday, November 16th in New York City. The luncheon recognizes animal heroes who have demonstrated extraordinary efforts as well as individuals who have shown great commitment to animal welfare during the past year. The award-winning Connecticut’s Kid Governor® civics program was created by the Connecticut Public Affairs Network (CPAN) in 2015. Through this free program, students across the state are nominated by their classes to run for Connecticut’s Kid Governor. The candidates are required to submit a campaign video about a community issue important to them, as well as a three-point plan designed to help other students take action on the issue. Seven final candidates move onto the week-long election where peers watch their campaign videos, review their platforms, and cast ballots to vote for their state’s Kid Governor. The winning student serves a year-long term as Kid Governor, with the opportunity to promote their platform via the program’s website and online blog, by meeting and speaking with their state’s residents and by participating in programs across the state. 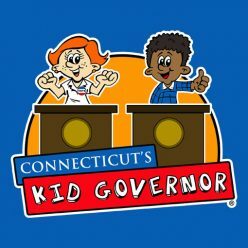 Registration for the 2017 Connecticut’s Kid Governor Statewide Election is currently underway, with the Statewide Election slated for November 6-14, 2017. You can learn more about Connecticut’s Kid Governor– both the program and the student– at CT.KidGovernor.org or by following CTKG on Facebook, Twitter, and Instagram.